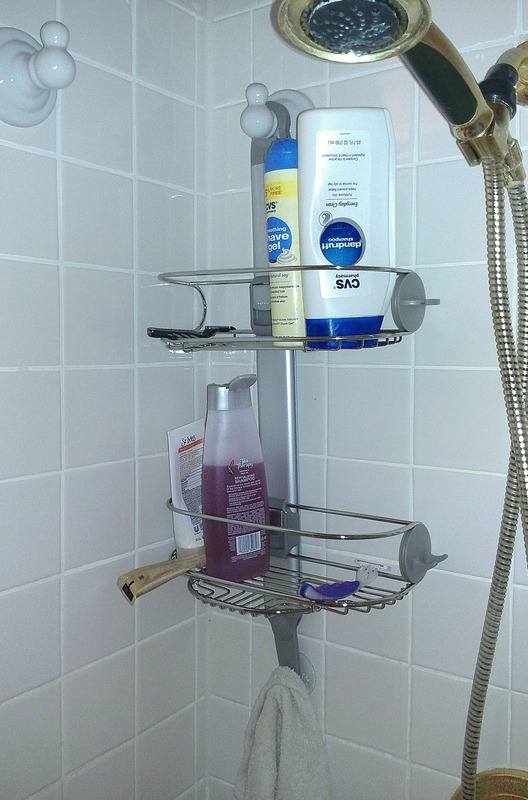 Every shower needs a place to put the shampoo and soap, the razor and the washcloth, and various sundries. Usually, this is some built-in that’s hardly usable or a caddy hanging from the shower arm–right where it’s in the way. A few years ago, when they started selling the Scrubbing Bubbles “Automatic Shower Cleaner,” I decided to give it a try, and in so doing came up with a superior solution. Houston has very hard water, which is to say, there is so much lime in the water, if you let the sprinklers hit the siding, the house will slowly turn gray as limestone forms on the brick. This cleaner, while not likely to meet up to it’s hype, seemed likely to help (and experience has born this out) but only if mounted where it will spray all the glass. Hanging it from the shower head wasn’t going to do the job. Instead, I found a simple ceramic robe hook and mounted it in the right location by drilling through the tile, then sealed around it with latex calk. While I was at it, I mounted two more hooks (shown here), one to hold my washcloth up out of the way and the other to hold the show caddy. This puts the caddy over to one side where it doesn’t interfere with the show hose and doesn’t get in the way. I’ve had this installation for about six years now, and it’s been a neat solution. I really haven’t given it a second thought until the other day when I replaced the old rusted caddy with an adjustable stainless steel unit by Simply Human. I hung the new caddy, tried it out, and was left wondering why every shower isn’t made this way. Now yours can be too. All you need is an all ceramic robe hook (the metal mounting bracket will be sealed behind the calk, and a $2 masonry bit.